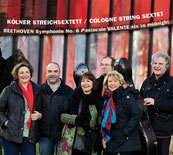 The Cologne String Sextet was founded in 1997 by Demetrius Polyzoides and the (deceased) Uwe Ender with the goal of performing chamber music for string sextet with a fixed personnel, and continual work. The members of the group hail from different countries and have extensive experience with chamber music and as soloists. Aside from the continual attention to the classical and romantic sextet literature, the group has dedicated itself to the distinct, transparent realization and to an artistic involvement with the musical avant-garde. Through this the sextet literature has been enriched through the compositions of, among others, Augusto Valente (born 1959) with his “Six to Midnight”, Wolfgang Danzmeier (born 1947) with his “Zum Beispiel Isolde”, and Tatjana Komarova (born 1968) with her “Auf immer und Ewig!?”. These in addition to the numerous forgotten works of the sextet literature such as the Cologne composers H. Koessler and E. Frank. The sextet has played on numerous radio productions, has produced CDs, and has played concerts in Germany and internationally. A concert by the Cologne String Sextet in June 2000 at the Beethoven House in Bonn on the occasion of the presentation of a facsimile of Beethoven’s 6th Symphony (Pastoral) to the public won much recognition. The ensemble played a string sextet version of the Pastoral by M. G. Fischer, a contemporary of Beethoven’s. All recordings of the ensemble can be found at “discography”.